Until Saturday 21 June 2014. Alan Ayckbourn’s fabulous comedy takes us to October 1996. Frequently the farce had the crowd in stitches as it explored the complex lives of four characters who live under the same roof. Claire Price is superb as the, sometimes outrageous, single Barbara. She used to be the Head Prefect at school and nick-named “Spike” as a reference to how she dealt with her peers. She has turned her childhood home into flats. Below her floor is the postman Gilbert who is gives the audience many opportunities to laugh thanks to Simon Gregor’s brilliant comic timing. 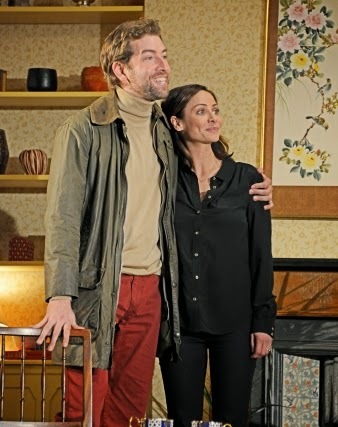 Former school-mate Nikki, played by the wonderful Natalie Imbruglia in her stage debut, has agreed to take on the upstairs flat with her fiancé Hamish, a role which Edward Bennett obviously relishes. The designer Giles Cadle has produced a proficient stage set which focuses on the middle floor but enables to audience to have a partial view of the other two floors. Laurence Boswell’s direction leaves some of the action to the imagination on these other two floors. 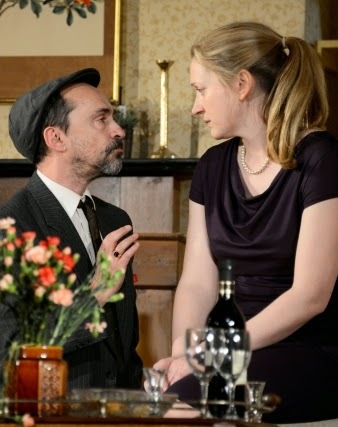 As soon as Hamish enters the house the battle of wills ensues between the independent and strong minded Barbara and a man she immediately forms an opinion about, as he is vegetarian. As the interdependence of the housemates is explored, the natures of the various relationships are exposed. Natalie Imbruglia makes a confident start to her stage career and Simon Gregor is at the centre of many light hearted moments. Claire Price does an awesome job anchoring the story together and, along with Edward Bennett, she propels the audience through a range of emotions. Things we do for love is a fabulously funny treat.